Removes stale odours from urine, vomit and food spills. For use on carpets, upholstery and fabrics. Can be used as a general cleaner and odour controller. 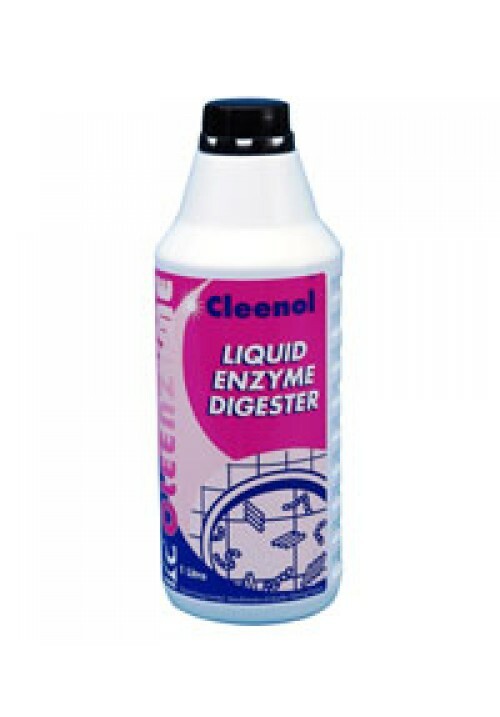 The bacteria in the product release digestive enzymes that degrade the stain and odour causing materials, thereby eliminating the source of the problem. The natural enzymes used do not stain or harm fabrics or materials that are unaffected by water. A concentrated blend of biodegradable surfactants and naturally occurring micro-organisms which work together to achieve excellent general surface cleaning on both hard and soft surfaces. May be used in carpet extraction machines. Shake container before opening. The formulation is activated by diluting with water and should then be used within 3-4 hours after dilution. Excess solution can be used to clear sinks, urinals and toilets. For carpets and fabrics: dilute 1:1 with warm water, brush well into soiled area and leave to dry and vacuum. Cover area with damp cloth if it is likely to dry out in under 3-4 hours. For concrete, tiles: dilute 1:1 for heavy soiling. Mop on and remove excess moisture but allow to dry naturally. Dilute 1:20 for more frequent use. Black mould etc in grouting: Scrub in neat product and wipe clean with damp cloth.